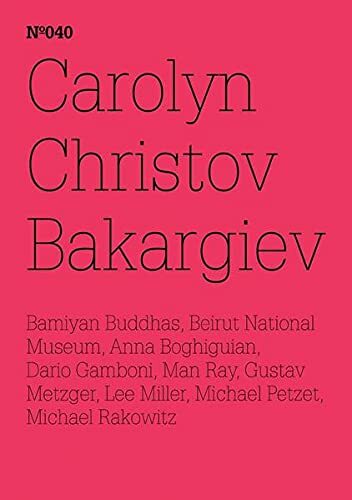 Carolyn Christov-Bakargiev reflects on the historical as well as personal notion of destruction and art, as well as on the potential healing power that art can have. Guiding us through a web of etymological, historical, philosophical, personal, and art historical references, she takes the reader from Melanie Klein’s thinking about the dyadic relationship between mother and child and Walter Benjamin’s reflection on Klee’s Angelus Novus, to object studies starting with Man Ray’s metronomes, his Objects of Destruction, and Lee Miller’s photographs from the end of World War II, to Gustav Metzger’s “Manifesto of Auto-Destruction,” to melted objects from the Beirut National Museum and the blown-up Bamiyan Buddhas, which are accompanied by Michael Petzet’s report of ICOMOS’s response to the destroyed monuments, followed by artworks by Michael Rakowitz and drawings with poems by Anna Boghiguian, in addition to a postscript by art historian Dario Gamboni on the destruction of art, the concept of “world heritage,” and the legislation around it. For Christov-Bakargiev, “the sphere of art is poised on the edge of the private and of history, and becomes the location where one can experiment the possibilities of being on the edge of the anthropocentric, where the rubble lies.” Carolyn Christov-Bakargiev (*1957) is Artistic Director of dOCUMENTA (13).